The Flymo 1200R is a robot mower that is aimed at the smaller gardens. It is a great value model that will keep your garden in perfect condition while you do other things. No longer will you have the chore of cutting the lawn and you won’t have to store a bulky lawn mower in the shed or garage taking up valuable space. This is a great little robot mower that is designed for the small to medium sized lawns of up to 400 square metres. It can deal with flat lawns and slopes of up to 25% for some of the more challenging areas. This is a great option for those who are looking to replace the standard mower and don’t want to spend a fortune, it will cut the average sized UK lawn with absolutely no issue giving you a garden that is always in top condition and a large amount of time back to do what you want. 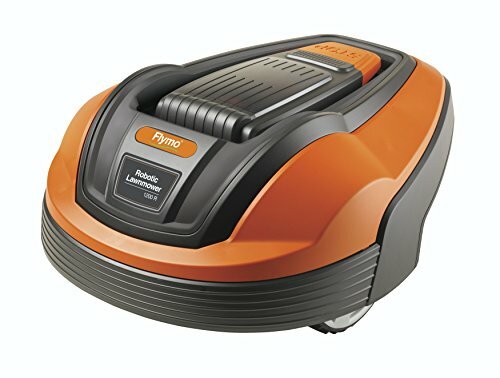 As UK houses get smaller and sheds and garages become full the Flymo robotic mower will save you a lot of space. It will stay outside on the charge station waiting for its next scheduled cut. You can then get rid of that bulky awkward push mower that takes up so much room. This popular model has got a lot of great customer reviews from many owners that now have perfect lawns which is a great recommendation in itself. Once you own the Flymo 1200R there is no turning back to normal mower, you will be hooked! Here are just a few of the pros to owning the Flymo 1200R. Suits the average UK lawn size. Get more free time back. Fantastic space saver as it will stay outside. Feeds your lawn while cutting. Their are a couple of downsides but nothing that will stop it working very well. Not suitable for larger lawns. Cannot deal with steps or steep slopes. More expensive than a conventional mower. Having an automatic mower in the garden with children and pets can be a concern but the safety features on the 1200 R robot mower are second to none. Lift, tilt and bump sensors make the Flymo 1200R Robotic mower a safe mower to have working on your lawn. If any of these sensors are triggered it will stop the blade immediately. There is also a PIN code that is needed to unlock the mower to change the mowing schedule so that it cannot be used at any other time by another person. This is great for security and safety and coupled with an alarm in case it gets lifted off the charge station you can be sure your garden will be safe. This is a great value for money mower that will suit the average garden in the UK. If you are prepared to spend a little extra on a mower that will give you a great condition lawn and plenty of free time back then it is money well spent. Cheaper than most of the models that are designed for bigger lawn areas the 1200R does the job very well covering the basics. With so many great reviews most people believe it is a good investment. Installation of the 1200R is similar to most robot mowers out there. It works on a wire boundary system to mark out the areas of lawn you would like cut. The robot will pick up the boundary and map out your garden making sure that it cuts everything within the boundary. The installation for this model will be quick as it is designed to work on smaller lawns up to 400 square metres although this does depend on how many borders, trees and other obstacles you need to map out. Once the lawn is mapped out you just need to plug in the charge station and place the mower into position and it will take care of the rest. Below are some of the features of the 1200R to have a look at, it covers all of the basics well. If you have an average size lawn then read on. The sensors on the 1200R along with the boundary wire create a map of the lawn so that every little bit of the lawn is cut. The robot then proceeds to cut the lawn in a random pattern which mean it doesn’t leave any tyre grooves that a normal mower would. This gives you the perfect flat finish to your lawn. The electric motor on the Flymo 1200R robot mower is a quiet electric motor that will mow the whole lawn without creating hardly any noise. It is so quiet that you can let it run while you are asleep and it won’t wake you up! Choose a program that suits and relax in peace and quiet without the drone of a petrol motor in the back ground. you can choose your cut times and days with the easy to use programmable schedule. The easy to use screen on the robot mower itself allows you to quickly set it up to the schedule so that you can ensure the lawn is cut when you are not using it. The regularity of the cutting is up to you and can be done every day if you require. The grass clipping are cut into a fine dust by the blades that falls down between the blades of grass and settles on the ground. As the R1200 cuts the lawn so regularly it will only have tiny bits if grass to cut up. The additional benefit of this is that it will fertilise your lawn giving you a very green and healthy lawn after a while of using. You can adjust the length of your grass by turning an easy to use knob on the unit to alter the cutting height between 2cm and 5cm. When the mower is new it is often good to start off at the longest setting and gradually work down to the height you require. The electric motor and lithium ion 18v battery power the blades to give you a crisp and good quality cut to the lawn. It will cut for about an hour before retreating to the charge station for a re charge which takes about 75 minutes. Once it is recharged it will take itself back out and carry on mowing where it left off. This great value robotic lawn mower is perfect for the average home. Save space and time by getting rid of you conventional mower and installing the Flymo 1200R for a perfectly manicured lawn all year round. It gives you plenty of flexibility as to when you want the lawn cut and how long you want it. Once the set up is done you can sit back and enjoy having a usable garden. This model is making it easier for the average family to own this technology without breaking the bank. You no longer have to look at the garden as a long list of chores, it will be more of a space to relax. Highly recommended model for the masses!